One of the central figures in the Battle of the Bulge was a corps commander, Troy H Middleton. He commanded VIII Corps. General Middleton wore three stars and commanded the troops deployed in front of the Ardennes Forest, the avenue of approach that the Germans employed to launch their attack. This area was used by the Allies and the Germans to send divisions needing a bit of refitting after intense combat or to get some combat experience for green divisions. Middleton’s VIII Corps was very strung out holding a distance that would likely have been assigned to at least an additional corps. He recognized this and had his corps deployed in a series of outposts rather than a continuous line of defense. This outposting would eventually figure prominently in the subsequent battle. The Army is composed of sections/fire teams, squads, platoons, companies, battalions, regiments, brigades, divisions, corps, armies and army groups. There is a bit of intricacy as to armored units and cavalry units but, in general, this is how units are organized. Middleton had about 100,000 men in his corps. A corps is typically 3-5 divisions plus corps troops like heavy artillery and combat engineers. Very good troops all. Middleton had been the youngest Colonel in the First World War and had commanded a regiment of infantry with great success. He was an inspirational leader in combat at the same age as many of The Boss’s CEO clients. He was promoted based on his success. General Middleton had paid his dues to learn his trade and was an effective leader, trainer, teacher, tactician and problem solver. He was well liked by his subordinates and staff. He was a no nonsense kind of guy who counted amongst his friends and contemporaries Eisenhower, Bradley, Patton and many others. He knew them as junior officers and thus their relationship was longstanding. He was a bit older than those fellows but had seen much more combat when the Second World War started. He had gotten his first taste of combat chasing Pancho Villa in Texas and had served in Galveston. Middleton retired from the Army in the years before the outbreak of World War II. He retired to a senior position as the business manager of Louisiana State University and, after World War II, he would return to become its most beloved President overseeing LSU’s incredible growth. He left huge footprints in both the military and education. LSU, of course, was famously founded by America’s most famous home grown war criminal, William Tecumseh Sherman. LSU had a huge ROTC program of which Middleton was the Commandant of Cadets during his Army tenure while simultaneously serving as the University’s Dean of Students. When the Japanese attacked Pearl Harbor, Troy Middleton offered his services to the Army and they took him up on it. There was a huge shortage of combat experienced senior officers because of the time period between the wars. He initially commanded a division — 45th Infantry Division — in the invasion of Sicily and in the fighting in Italy. He was well blooded and knew his trade long before D Day was on the horizon. He was a calm but very aggressive division commander and had the effectiveness of a Patton but with none of the histrionics. He was a steady hand in a troubled sea. His staff loved him which is often a mark of a very good commander. He fought in France commanding a corps and was in command of a corps, VIII Corps, as the Battle of the Bulge began. I could write another 100 pages about General Middleton and his exploits — all laudatory. But the big take away that applies to current day entrepreneurs is the nature of hte large decisions he made during that battle. The Germans were pressing hard and Middleton’s deployment of his corps in a series of blocking positions astride the road network turned out to be a very important tactical consideration. Even though the Germans had attacked in strength, Middleton’s corps held key crossroads which prevented the German armor from utilizing its mobility and moving with any speed. In this manner, Middleton’s deployment bought the Allies time. The situation was quite chaotic with the Allies struggling to divine the German intentions. Remember the Allies had been driving the Germans ever eastward and were up to the Siegfreid Line and then to the Rhine River itself. The Germans achieved tactical surprise. 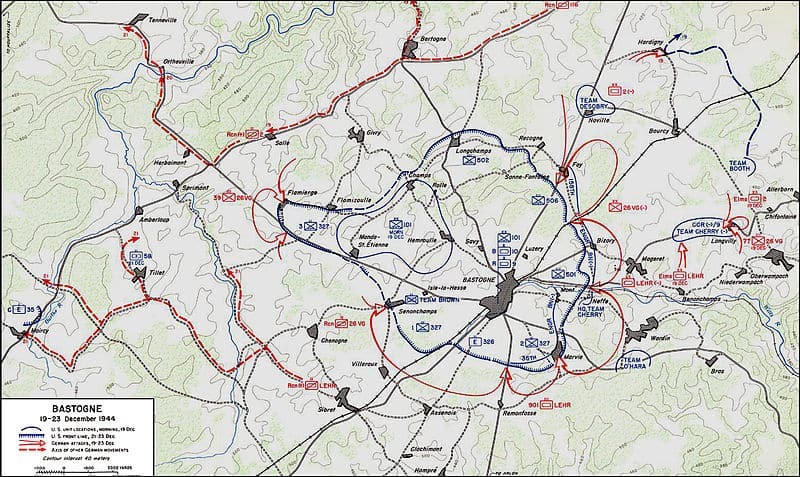 Middleton immediately recognized that this was neither a spoiling attack nor a simple counterattack to “tidy up” the lines because he began to get intel indicating a lot of new German units that had not previously been in this area of operations. He was likely the first to realize this was a big deal. Competitive, market research with a military flair. He also understood the necessity to gain time to sort things out, to re-deploy troops, to counterattack and to hold ground. His market research informed his subsequent decisions. The Battle of the Bulge was turned into an Allied — American really as it was almost entirely American leadership and troops who did the fighting and dying — victory in no small part because of the performance of the 101st Airborne Division and the 10th Armored Division. The 101st ABN gets a lot of well deserved praise but folks often overlook the role of the 10th Armored Division which was also at Bastogne even before the 101st ABN arrived. You can read about the Tigers of Bastogne, the 10th Armored Division here. Middleton brilliantly was able to understand that the German offensive — driven primarily by Panzer divisions following on the success of straight leg infantry — was all about mobility and whoever held the roads would determine the outcome of the battle. He put his finger on Bastogne and said — we have to hold Bastogne. The 101st ABN was dispatched to do just that. But Middleton had to buy enough time for the paratroopers to get there. His strategy of blocking positions and outposts began to bear fruit as the Germans were delayed time and time again at critical crossroads and consumed valuable time in trying break these roadblocks. This tactical decision in the face of otherwise bad news, bought the requisite time for the 101st ABN to get to Bastogne and to build an all around defense. They knew from the start they were likely to be surrounded. Interestingly enough, the combat engineers — organic divisional units and corps level units — were instrumental in these blocking positions time and time again. Many divisions had held their combat engineers in reserve. The combat engineers are typically the most adept infantry unit in a division as well as being the experts on fortifications and mines and demolitions (blowing up bridges in particular). The engineers would mine the approaches to a roadblock thereby requiring the German armor to move cautiously giving American artillery, tanks, tank destroyers and men with bazookas the opportunity to knock out immobile German tanks. In addition, the combat engineers are demolition experts and thwarted the German advance by blowing up strategic bridges after the Germans had committed to a route march along a road containing a bridge. The engineers would blow the bridge and the Germans had to back track to another road. Time killer. Skills — combat engineer skills — which made their employment in blocking positions very powerful. The Boss was a combat engineer in his military career and thus appreciates this fact. The use of the 101st ABN was also a stroke of genius as paratroopers are routinely used to being surrounded by the enemy and fighting their way out. Hell, paratroopers purposely jump into the enemy’s back yard and look for trouble. The prospect of being surrounded at Bastogne for the 101st ABN was a yawn. Middleton’s selection of this particular unit was a stroke of genius. The Boss was a paratrooper in his military career. Middleton made the decision to hold Bastogne at all costs and to deny the Germans that transportation hub and the road network. It was a very tough decision as the 101st ABN and the 10th Armored divisions were outnumbered 5:1 or more and 20:1 locally when attacked. But Middleton had deployed artillery in depth and made the Germans pay for any movement in front of Bastogne by raining steel down upon them. It was a tough decision but the right decision. When asked to allow a fighting retreat, Middleton said NO. As entrepreneurs, you will also have to make tough decisions in the chaos that is a startup. Know that sometimes you have to make a very tough decision and make it stick. You can do it. When George Patton, CG of Third Army, was turned to the relief of Bastogne and got through he asked Middleton why he allowed the city to be surrounded. Patton, Middleton’s new boss now with the Third Army in Bastogne, questioned the wisdom of Middleton’s decision. When the battle had run its course, Patton sent a letter of commendation to Middleton for the wisdom of his decision to hold Bastogne at all costs. Many observers will opine that Middleton’s decision to hold Bastogne and deny the Germans that road network was the pivotal decision of the larger battle but more importantly his ability to lead and inspire his corps to success in the face of horrific winter conditions and German attacks was brilliant. As a startup CEO, I hope you will not face such life and death decisions but you will face some tough ones. Draw inspiration from guys like Middleton — not flashy like Patton but a competent, thoughtful man who made important decisions that determined the outcome of momentous events. Just like you will be called upon to do in your startup. And, like General Middleton, you can do it. If you want to read more about Middleton — whose story as the President of LSU is at least as inspiring as his military exploits in Mexico, World War I and World War II — you may like this book. But, hey, what the Hell do I really know anyway? I’m just a Big Red Car. Be kind to someone today and kiss your loved ones. This entry was posted in Crisis management, Decisionmaking, Excellence, Inspiration, Leadership, Wisdom and tagged crisis management, leadership, middleton. Bookmark the permalink. Hitler’s objective was to split the Americans and the Brits along their lines of responsibility (Montgomery in the north and Bradley in the south) and to cross the Meuse and drive to Antwerp. He then intended to try to negotiate a peace and concentrate on beating Russia who was already at his doorstep. Middleton was the first senior officer to recognize this was not a spoiling attack and he acted accordingly. The Lts and Capts who held those crossroads, particularly the combat engineers, determined the outcome of the battle. They bought the time Middleton needed to hold Bastogne. Because Middleton was so well thought of by Hodges, Bradley, Eisenhower and Patton — nobody really second guessed him except for Patton originally but later realized how brilliant Middleton’s stand at Bastogne really was. There is much to learn from this tale. Middleton went on to become President of LSU and made LSU the university it is today. A very sound and humble and competent man. In short supply today, no?